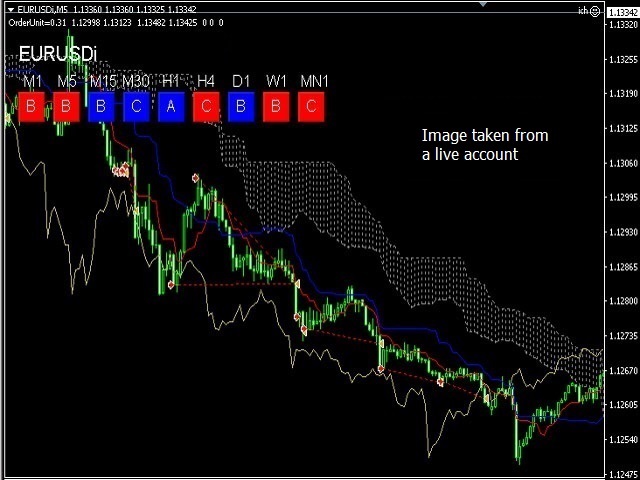 Ichimoku Cloud Super Rider is easy to use full automated EA that designed to generate profits by gaining multiple smaller profits with variable lot size control - The EA watches so many things based on the Ichimoku theory to calculates the risk for the given market. At the lesser confident market, the lesser lot sizes traded and vise versa. Because of the principle, narrower split are better, no or small commissions are better. Recommended minimum deposit is >$500 although bigger numbers are better as the variable lot size control works well with >$1000 due to the minimum lot size for the accounts. The EA works with EURUSD M5. For the backtest, make sure to download all the history data available for M1 to MN1 for the period from few months earlier of the test starting date to current for the indicators to work correctly. *My 99.9% quality results were tested with Ducascopy and TickDataManager. UI has the boxes to indicate the cloud vs price status for each timeframe to glance M1 to MN1 status on one chart. Blue box = Senkouspan A is above Senkouspan B. Red box = Senkouspan A is below Senkouspan B. Yellow box = A and B are at the same price. Letter 'A' = the price is above the cloud. 'B' = below the cloud. 'C' = in the cloud meaning the price is between Senkouspan A and B. *In Visual mode backtest, only the M5 indicator works due to the MT4 backtest limitations. MagicNumber : Magic number. Can be left 0 to assign one automatically. TextComment : Comment to supply for each trade if its desired. FixedOrderLots : If it's other than 0, EA uses the number for the base lot size to trade. It still can change a bit depends on the market confidence level although the lots size specified will not scale by the account size. RiskPercentagePerTrade : Risk value. Bigger the numbers, EA places bigger lots for a trade. Default is 0.1. MaxOrdePerPair : EA will place more than one trade when the market goes against to it. The number limits how many trades can be placed to compensate. MarketOpenH : On Mondays, EA won't start trading until the time passes the time specified by MarketOpenH for hour and MarketOpenM for minutes to avoid large spread. MarketOpenM: : On Mondays, EA won't start trading until the time passes the time specified by MarketOpenH for hour and MarketOpenM for minutes to avoid large spread. MarketCloseH : On Fridays, EA won't trade after the time specified by MarketOpenH for hour and MarketOpenM for minutes to avoid large spread. MarketCloseM : On Fridays, EA won't trade after the time specified by MarketOpenH for hour and MarketOpenM for minutes to avoid large spread. Slippage : Maximum slippages allowed. Major performance improvement by the trend detection algorithm tuning. One of disadvantages of the trend following systems is slower response to the ongoing trend changes. This version will pickup the current trend quicker than the previous versions and should respond sooner to place the trades. A couple of major bug fixes that contribute some performance improvements. 1) The problem hindering performance with Euro base systems. 2) Break even exit control with some larger lots. Minor bug fix for the symptom only happened with the backtest/demo when the history buffers were empty. No impact to the live operation. Safe to update while positions are open.